Large, bright and filled with natural light, 52 Old Elvet’s first apartment is certainly befitting of the number one name. Located to the right at the foot of the staircase, The Villiers boasts a stunning open plan living room overlooking the street. At one end a striking marble fireplace gives this unique room a strong sense of tradition, while the other end is home to a Shaker style kitchen. 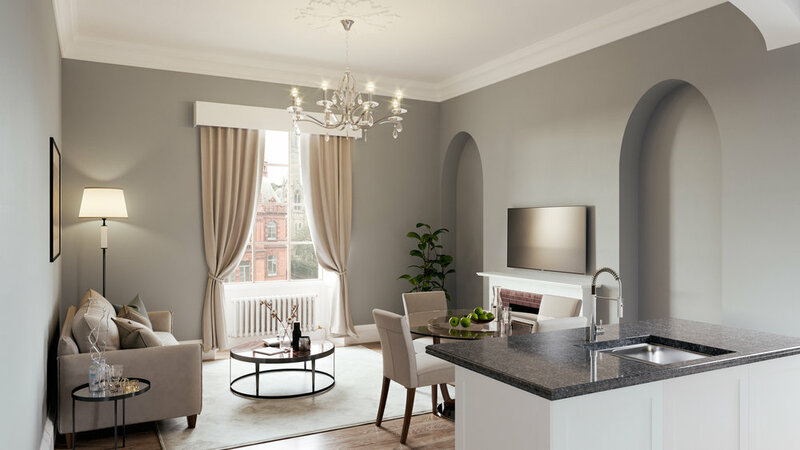 In a soft grey with granite worktops and island, this fully-equipped kitchen offers everything for the modern homeowner.The Villiers has two spacious bedrooms, both with their own en-suite bathroom, tiled in neutral shades of stone. It also has a wet room, uniquely designed for this apartment alone. 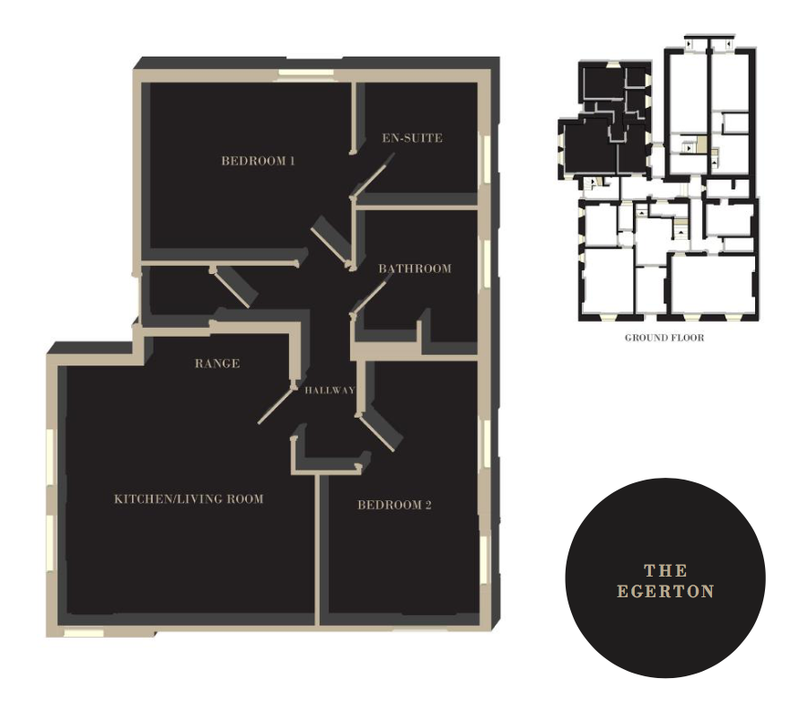 The Barrington, a gorgeous one bedroom apartment lies in a prime position to the left of the entrance hall. A unique and charming combination of period features and contemporary styling, it has everything you could possibly want from a living space – and more. 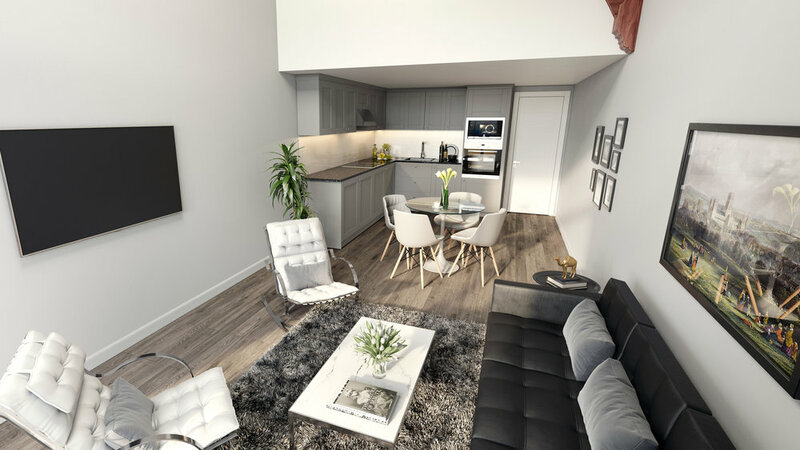 Like the other properties in this new development, The Barrington is built around a sizeable living room and kitchen, and offers a lot in terms of décor. The spacious bedroom overlooks a lane at the side of the building, while the bathroom is decorated in calming shades of stone and slate. Situated in the west wing, The Egerton is a two bedroom apartment, and the only one within the main block which has its own private entrance from the side of the building.This discreet front door once acted as the service entrance, and now leads into what was originally the kitchen. Now it is home to a bespoke living area and kitchen. This features one of only six ranges produced and manufacturers in Durham which are still in situ, and provides a focal point for the room which works in curious harmony with its contemporary island kitchen. The fourth apartment in this beautifully restored building is one of two homes built into what was once a purpose-built billiard room. Back in the 19th Century, many of the country’s most prominent figures would meet at 52 Old Elvet to make deals and enjoy dinner before retiring to the billiard room – a vast, vaulted room with a glass panelled roof supported by polished timbers. Part of this huge, stunning room is now The Wolsey, a beautiful two-bedroom home. Accessible from the rear of the building, it also houses a wrap-around staircase which leads to an upper floor area. Like The Wolsey, the Tunstall has been created in the unique space formerly used as the billiard room. Designed by Charles Hodgson Fowler – who was also architect to the Dean and Chapter of Durham – this incredible room lends itself perfectly to this luxury one bedroom living space. Due to the position at the back of the building, access to The Tunstall is from the rear of the building, giving a little more privacy. It boasts a calming, modern décor and like The Wolsey has a unique staircase which leads to a cleverly-designed upper floor space, ideal for use as a study area.